Grant Baldwin is someone who I’ve known for a while but we didn’t actually meet face to face until recently at NMX. In fact, I was featured on his podcast “How’d You Get Into That” several months ago where he interviews unique business owners. Not only does he run a popular podcast but he’s also a professional motivational speaker for students. And the man is very prolific. I think last year he spoke at 60 events throughout the year travelling all across the country. So here’s what’s cool about Grant. Giving incredible speeches all across the country is lucrative but it is not scalable because you have to physically be there. And after having kids, Grant realized that he wanted to scale back the travelling to spend more time with family. So he sat down and figured out a way to turn his talents and passion into a more scalable business and he’s had a lot of success in a short period of time. How do you turn motivational speaking into an online business? You are listening to the My Wife Quit Her Job Podcast, and if you are new here, it’s a show where I bring in successful bootstrapped business owners, to teach us what strategies are working, and what strategies are not. Now I don’t bring on these famous entrepreneurs simply to celebrate their success, instead I have them take us back to the beginning, and delve deeply into the exact strategies they used early on to gain traction for their businesses. Now if you enjoy this podcast, please leave me a review on iTunes. And please join me for a free live workshop on e-commerce which I give on a regular basis. For more information about the workshop, go to mywifequitherjob.com/workshop. And if you want to get a jump on starting your own online business, be sure to sign up for my free six day mini course, where I show you how my wife and I managed to make over 100K in profit in our first year of business. Go to mywifequitherjob.com and sign up right on the front page, now onto the show. Welcome to the My Wife Quit Her Job Podcast. We will teach you how to create a business that suits your lifestyle, so you can spend more time with your family and focus on doing the things that you love, here is your host Steve Chou. Steve: Welcome to the My Wife Quit Her Job Podcast. In this episode I’m going to be talking to Grant Baldwin. Now Grant is someone who I have known for quite a while, but we didn’t actually meet face to face until recently at NMX. In fact I was actually featured on his podcast, ‘How did you get into that,’ several months ago, where he interviews unique business owners. And not only does he run a popular podcast, but he is also a professional motivational speaker for students. And the man is actually very prolific, I think last year he spoke at over 60 events throughout the year travelling all over the country. But here is what’s cool about Grant, now giving incredible speeches all across the country is lucrative, but it’s not scalable because you have to physically be there. And after having kids Grant realized that he wants to scale back to travelling to spend more time with his family, so he sat down and he figured out a way to turn his talents and passion into a much more scalable business, and he’s had a lot of success in a very short period of time. So how do you turn motivational speaking into an online business, now let’s find out, and with that welcome to the show Grant, how are you doing today man? Grant: I’m doing awesome dude, that’s a good intro, I like that that was nice. I’m just going to steal that and take it with me everywhere I go. Steve: I’ll send you the slides afterwards. Steve: And so give us a quick background story, tell us about your business, your speaking business at first, and then how you got started with everything. Grant: Yeah, I have been a speaker, a full time speaker, for about eight years or so and travel like you said all over the — primarily the US, speaking in a lot of different conferences, conventions, a lot of what I did early on was with students, still do out with students, high school, college students. Today we also do a lot with entrepreneurs and small business owners. And so yeah, a lot of it — a lot of what of what we talk about is kind of along the lines of motivation, we also talk a lot about careers and work in general. So it’s been a really cool gig, and even cool like you eluded to there. It’s fun, but it’s not very scalable. So it’s a very — I had a friend say one time, it’s a very high paying manual labor job, meaning when you go get on stage and you get to run your mouth for few minutes, they are going to give you a good check for it, but you have to actually go there. So we’ve been in this process of trying to figure out, how do we cut back on travel. Because travel and speaking it’s so a lot of fun, but again it doesn’t scale and you kind of hit that ceiling, how much you can charge, the number of events that you might want to do, as well as like you said, I’m a husband, I’m a father, I have got three little girls. And so as much as I enjoy speaking, it’s way more important to me to be a good husband, to be a good father. So trying to just figure out different ways that we cut back, and we got an online course that we’ve been utilizing to help with that, that’s been going pretty well as well. I think will get into it a little bit today. Steve: You know real quick, I actually didn’t know this about you, but are you doing this full time — the speaking thing is full time right? You obviously wouldn’t have time to hold down a day job in addition to the speaking gigs, right? Grant: Correct, yeah, we’ve been self employed for I think — self employed for seven years now, eight years full time. So yeah, when it’s good, it’s really good, and when it’s bad, it’s really bad, and that just kind of the highs and lows of entrepreneurship. Steve: And I’m just curious about this too, did you ever have a day job, like a corporate job at any point? Grant: Well yes and no, not like a traditional corporate job. I worked as a youth pastor actually for a little bit in my church. So I did that full time and that was kind of — it was kind of like my first like, real I guess career. And once I decided I want to do the speaking thing, I worked at a security company doing sales work for them. And it was just a 100% commission deal, which was nice because it provided a lot of a flexibility to go out and to travel, and to do booking, and speaking engagements. So that’s kind of — I would say the ball — more of my career has been self employed or not, so that’s been pretty fun so far. Steve: So I’m just trying — so I actually went through your site today, and I was just curious how everything kind of ties together. 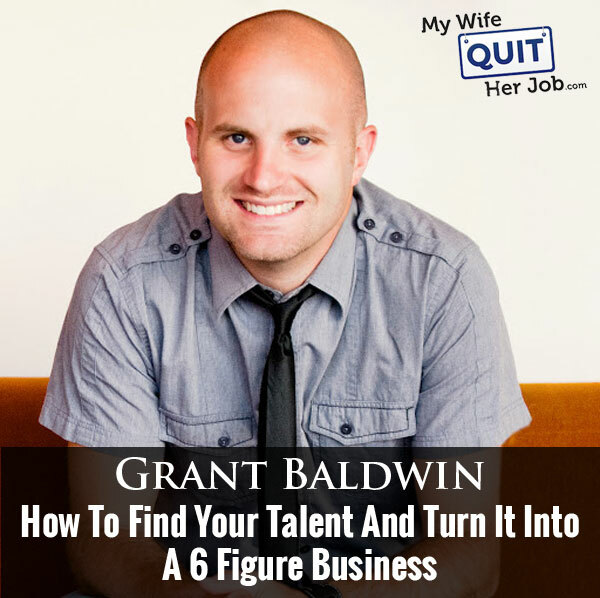 I know you have a website and you also have a podcast, are all those things kind of tied together, like how does grantbaldwin.com generate income? Grant: Yeah, good question, so the bulk of my revenue up until this point has been primarily through speaking. And we’ve got some products that go along with that for a lot of the student audiences that we speak to. So we’ve got a book, we have curriculum that’s used in about 400 high schools right now. And so that — between the product and the speaking, that has been the bulk of our revenue, and again that’s fun, but a lot of the product revenue which scales a little better than the speaking, a lot of the product revenue is driven from the speaking. So meaning I go speak, and I can turn around and sell product there as a result of the speaking. So again that’s all well and good, but it still kind of comes back to this challenge of scale, and you just — you hit the ceiling that there’s only so much you can do there. So a little over a year ago we started a podcast called ‘How did you get into that’, and part of it kind of came from — a lot of people were asking me that question as a speaker. People would come up to me after an event and say, “Hey, I’m curious, how did you get into that?” And I found that people always fell into one or two groups, either people wanted to become a speaker, and they are like I’m just curious, like what would be the next steps I would need to take. Or people would be like I have zero interest in speaking, that’s just fascinating that you make a living from that. And so I found myself asking this similar question to other people that I would meet too, just have something like unique, random type of career. It’s like that’s just — I don’t necessarily want to do that, that’s just fascinating that you do that. So if you can make a living doing that thing, then surely I can figure out my thing. And so we started the podcast, just interviewing people that were just doing something interesting, things that just caught my attention, things that I was like how do you go by getting into something like that. You are a great example, we had you on Episode 89, and we were talking about that like, how do you create a business selling handkerchiefs, like I didn’t even know like that seems like a very small niche thing, how do you go about getting into that. And so we’ve had over 100 episodes now just talking with people about this. So naturally as a speaker there are a lot of people who would say, hey, one of the things I’m interested in, in terms of a career and how to get into something is, how to become a speaker. And so a couple of months ago we started a course called ‘booked and paid to speak,’ where we are teaching people about that process of going from I have zero engagements, I just know that I want to speak, I have no idea how to get started. And teaching them how to go about and get that going. So that’s been going really well, that’s been a fun project, and it’s definitely an opportunity to help more people, and to scale both impact and income. Steve: So let’s talk about your class real quick, so how is it structured and when it comes to public speaking I would think that it’s kind of a hands on sort of teaching requirement, right? Like if I’m going to learn about speaking, I’d probably want someone right next to me kind of looking at me and just telling me what I’m doing wrong and that sort of thing. So how do you kind of turn that into a digital course? Grant: Yeah, a good question, well there’s basically two sides of the coin. You have the art of speaking, which is the actual speaking itself and being on stage and presenting that, and then you have the business side of it. And so I don’t — within the course we talk a little bit about the art of speaking, but the bulk of it is on the business of speaking. And so that doesn’t require as much of the personal — the one on one interaction. And so that’s a part I personally enjoy, I really like speaking, but I don’t — all the hand movements, and I walked this side of stage to make this point, and then I do this thing, and then I have this voice inflection, and like all that stuff like I just — like I understand it, but I just I don’t gig out on it, that doesn’t do a lot for me. And to be honest with you and I guess it’s been a bit difficult for me to kind of reverse engineer. Like people ask me like, why are you a good speaker, how do you become a good speaker? Like you just do it a lot, like I don’t know that there’s any like magic seeker recipe of — if you are speaking in this way, and if you talk like this, and you have a deep breath, and then you get really quiet. Steve: So like lesson number one, just go on and do it a lot, all right. Grant: Well, honestly like that’s kind of how I felt, like I think am a really good speaker, but how did I become a good speaker? Because I have done it hundreds and hundreds of times in a lot of different situations, so you just kind of figure out what works and what doesn’t. So how I would reverse engineer that, I don’t know that I have a great answer for it. But what I’m interested in and what I do feel like I have a good grasp on is how you actually get bookings, because whenever I got started as a speaker, I didn’t have a podcast, I didn’t have a blog, I didn’t have a platform, I didn’t have any social media, nobody knew who I was, yet for my very first speaking engagement they paid me $1000 to go give a 45 minute talk. And so that was just mind boggling to me that — here I’m with no platform, no prior experience, but I went out and I found them, found an existing event that had a need with — and I offered a solution for, and so it was a great fit. And so from that we’ve been able to build a very successful business, we’ve been able to teach other people, here is how you would go about – actually let’s assume that you are a decent speaker, let’s assume you know what you — you have some idea of what you want to talk about, now what? Do you just sit back and wait for the phone to ring which is what a lot of people assume like, hey I’ve built my website or I have a video, I have got it up online. If I build it they will come and they are not coming and I don’t know what to do now. So instead we’ve told people no here is how you actually find events, here is how you find bookings, here is how reach out to them, here is how you find decision makers, here is how much to charge. And all of those type of pieces that when you are just getting started, you just don’t know. And so that’s a lot more of what we focus on within the course. Steve: How did you know that there was demand for this? Grant: Well, partly it was just paying attention to the people that are asking me questions. And I think that’s a great thing for anybody and any type of industry is what are the things that people are regularly asking you questions about? So Steve in your case, I assume people are coming up and going like, okay you built this business on handkerchiefs, and I’m interested in — My wife wants to quit her job and come home, and we’re thinking about doing– even if we made like 500 bucks a month, that would be game changing for us. How would we go about starting an online e-commerce store? And so when you pay attention to what it is that people are regularly asking you for, then you can start to kind of piece together and say, okay clearly people are viewing me as an expert, I may not be the best in the world in this, but obviously I have some basic knowledge from my experience, and now I can start to put that into work. And so that was part of it for us, was you just over years, you just have enough people that are interested in this subject or topic, and you’re like I think there’s something there, I think we can give this a shot. Steve: So here’s the piece that I’m missing here, so you mainly give speeches to motivate students, right, and so this audience that you’re talking about, are these people that just follow Grantbaldwin.com, or these priority students that you’re speaking to? Grant: Correct, yeah. And really on a lot of our business was for students, and today we do a descent amount of adult stuff as well where parents, teachers, educators, business owners, entrepreneurs. This year I’ll be keynoting Fincon, speaking at NMX, those types of events that are also in our space and in our niche. So there’s plenty of people that are wanting to become speakers that want to speak to students, and they recognize that I have a lot of experience in that, but there is also people who are saying, hey I would love to talk to busy mums, I would love to speak to people about fitness, I would love to talk to people about overcoming divorce. So there’s a lot of different people in a lot of different niches and industries that are part of the course, who just say hey there is this thing I want to talk about. Here is this life experience maybe that I have had. Here is this group that I really resonate with. I just don’t even know how to begin to find them. And so the– although a lot of my experience this far has been with students and high schools and conferences and colleges, the process for getting booked in and paid to speak is relatively universal. There is going to be a little nuance differences here and there, but for the most part, the way that you go about getting booked for something whether– for me the way I went about getting booked for Fincon is going to be probably the same way I would go by getting booked for let’s say a college. So there is a lot of overlap there. It‘s not like you have to do it this way in that industry, you have to do a different way in a different industry. Yeah there may again maybe a couple little subtle things there, but for the most part there is a lot of overlap there. Steve: So you are getting questions from people who you are giving speeches to, so what’s the next step, like how do you know that all the– all your efforts in creating a class, whether it’s actually going to sell or not, did you do preorders, like how did you kind of launch it, once you had the feedback? Grant: Yes. So we did the– we did a validation process which is what I would highly-highly recommend and basically what that means is you kind of get a rough idea of what this is going to be. And so for me I wrote out on Evernote, I wrote out a long description almost like what the sales page could be, and just like hey this is a rough idea of what this is going to be, here is what I think are some of the modules we’re going to include, here’s an outline. And so basically what I’ve done is I had started kind of collecting some emails of people who would had expressed interest in this subject or topic, and then this is in January, this couple of months ago, I emailed– I don’t know maybe 100, 150 of these people and just said– just sent them the link to this Evernote like note that I created and just saying like, hey here is this idea I’m playing with, it’s not built, I don’t have anything, I don’t have anything to show you, but here’s what I’m playing with. And so I’m thinking about building this and it’s probably going to cost a few hundred bucks, but I tell you what, if you are interested in it, I’m going to take some preorders here and determine even this is even worth of building. And so we had, I think it was 22 or 23 people that paid 197 for basically and in reality as bizarre as it seems they’re paying thin air, they are paying for an idea at that point. Because I don’t have anything, there is not– I have nothing to give them. But by doing that, now I have some revenue, now I have some– I have people that are interested, people that are bought in, because you’re going to have plenty of people that are like yeah, I’d love that, that’s a great idea, you should totally make that, but people will validate it by actually paying for something. So by having 20, 25 people that would pay for something, now not only has it validated it for me, but also I get their feedback as I create the product. So what I would do is I would give them an outline and say hey here’s the lessons, here’s kind of what we’re going to be covering, what are the gaps? What are the things that you see that you wish I would be talking about or what are particular lessons that you are really looking forward to or you really hope I go deep, or you really want me to answer these questions. And so I’m able to get this feedback and I’m creating not what I just think that people want, but I’m also creating something that people actually want in getting their feedback. And so there’s that kind of balance there, because when you are getting started on something like speaking or building an e-commerce site, like you don’t know what you don’t know. But there is also some pieces that like they are really interesting, man I really– this is this something I’ve been wondering a lot about, and so I hope that he covers this within the course. And so it’s good to get that feedback from actual customers and clients and students that are in the– that are planning on going through the material. So it took me about 60 days or so to create the entire course, and the whole thing is digital, it’s all online, it’s eight modules, 26 video lessons, each lesson is anywhere from 10 to 30 minute or so. And they can– I would say it’s– there are some courses that are built where you have to go through module one in order to get module two, through two to get to three, and they all kind of build on each other. And there’s some of that, but in the same way there’s– it’s a bit of an encyclopedia where if you want to start at G, you can go to G and then you can skip to R and do that. So you can kind of bounce around of what you need some help with as it relates to speaking, and everybody is going to come into the course in a different place as well, there is going to be some people that have spoken 100 times and some people that have spoken zero. So you have to kind of account for that. So whenever we launched the course in March, we knew we had a– we were getting good feedback from the students that were going through it, it seemed like we had a good product. The challenge then for I think most people was like, okay how do I– I’ve sold to a handful people who reached out, but do I just sit back and wait for those other people to continually ask me questions on email and then I say oh by the way I’ve got this thing, how do I continue to pitch it? Steve: Yeah, that was my next question actually Grant. Grant: Yeah, [inaudible] [0:17:29] and so for us one of the things I was interested in was doing webinars and running Facebook ads to webinars, and I know whenever you and I hang out in Vegas we spend a ton of time chatting about this, because it was something I’d seen some people do and I was intrigued by the concept. And again it seemed like there is a lot of people out there interested in this subject topic of speaking, and so that was kind of the path of travel we’re planning on taking. Steve: Okay. So let’s dig deeper into that. So you mentioned driving Facebook to a webinar, so can we talk about like who you targeted, how much you spent, how did you structure ads, that sort of thing. Grant: Yap. So I’m pulling up here just numbers, we got a spreadsheet that we keep on all of this stuff. So our very first Webinar was march 3rd, we spent $535 in Facebook ads. So I think it worked out to about 100 bucks that day or so, from that we had 341 people register which worked out to $1.57 per person registering for the webinar. And that’s a key number to look at there is how much does it cost to actually get someone to register, not just someone to click on the page or the registration page, but someone to actually register. So that’s a key metric that we watch and we look at. So the ads themselves, we– I went through– I think I used Rick Mulready’s Facebook ads course. And so went through that, just to kind of get a basic understanding, because it shouldn’t be as complicated as it seems. And so you have campaigns and ads and ads all of that jazz, and so I just wanted to get like a descent overview of how like how does this work. So we created like a really basic ad, a picture of me on stage speaking, I don’t even remember what the hell was with that, but literally just kind of like going through existing ads of other people and just kind of following the template that kind of existed there. And so that went to a lead page where people could actually register for the webinar itself. We tried to do– I think we started promoting it basically five days out, because the further out you promote it, the easier it is for people to lose interest and to just forget about it, or things to come up and life to happen. So we would try to do five days, is usually what we tried to do, and we tried to have some emails in between there, because if someone registers at day five and it doesn’t happen for five days, then there is a lot, again even an app here where they could go– it could happen that people just lose interest on. So on the retargeting itself, I tried to target people that I knew were speakers, there I targeted interests like public speaking, motivational speaking, toast masters, speaker’s bureaus, speaker’s associations, like those type like speaker related subjects and topics. Steve: But those people might not necessarily be interested in learning how to book speeches, right? Grant: Oh, they are 100% like there is plenty of people who are like I just like Tony Robbins, I have zero desire to do that. So that’s where a lot of it on Facebook is it requires a lot of testing and it requires a lot of just playing around. So one thing that I learnt early on was within ad sets and I’ll try to make this as simple as possible, within ad sets a lot of times what people will do with ads is they will just pick like 10 different enters [ph], and look and lump those all together within one ad set, meaning like you can’t really tell which ads or which interest groups are converted. I can’t tell if Tony Robbins interest is converting better than public speaking interest, versus motivational speaking interest. So what you would do is you create individual ad sets for each of those interests. So now I can look at just Tony Robbins and I can see how much is it costing me per register of people that clicked from that interest? And I can compare that to just motivational speaking or just public speaking, or just [inaudible] [0:21:35] whatever the other things are. Steve: How big are there audiences typically for the given amount of ad spend that you’ve been spending? Grant: They are all going to be– the ones that we’re kind of looking at are usually a couple of 100,000 and how good or bad it is, I don’t know. Steve: So, for a hundred bucks a day, how much of that audience do you reach in five days– you do it for five days, right? Grant: Yeah, typically five days, I mean we started at around a hundred bucks a day, now we spend anywhere from like three to four thousand per campaign, which is going to be again like kind of three to five day type period. Grant: And so it’s – and again a lot of it is testing, just trying different options, trying different ads, different titles, different headlines, different copies, all those different variables there. Steve: So what’s the process? I mean it sounds like there’s so many different variables there, so what is the process that you guys kind of went through to kind of narrow things down? Obviously you can’t be targeting all these variables all at once, right? Grant: Correct, yeah, the process I went through is I hired a guy. Grant: So I work with him at just a contract basis. He is doing a lot more testing than I could. So where I might target you know people that are interested in Tony Robbins, and that’s my whole interest, he might look at okay, we’re going to specifically target women who are 35 to 55, on mobile phones in Canada who are interested in Tony Robbins. Steve: How did it work when you were doing it yourself, just curious? Grant: Honestly, I didn’t really change much, like I basically just used the same ad, and the same interest. And then if an interest like — if like for example on that first week of my average cost per customer per webinar registering, was a $1.57, again that’s kind of an average between all of the different ad sets there. So some may be a little lower, some may be a little higher. Grant: But the ones that may be really, really high, let’s say that there was some that were like five, six, seven bucks per register, I could just turn those off. And that way I’m spending more on the ones that are converting better. Or I could just, I could put more money towards those, whether I’m turning the other ads on or off anyway. Steve: So do you find that the conversion rate is the same across all the different interest groups once they opt in for the webinar? Does that make sense? What the question I’m asking is? Steve: So is the convert — like once they sign to the webinar, a percentage of them will convert naturally, buy your class, right? Steve: Is that conversion rate similar across all the different audiences that you’re targeting on Facebook? Grant: Not really. And so, then you need different tracking pixel for that. So it’s one thing to track what they — what interests people have that they clicked on that they would then register, but then you can also put a tracking pixel on the thank you page of the actual checkout card. So that when someone — that way, you can go back in later into Facebook on the back end and see that okay we had – let’s just, you know, for just round numbers here, let’s say it costs two dollars to get these people on a webinar. And it costs five dollars to get these people, but the five dollar people converted better so in fact it made us more revenue even though it cost us more upfront. And so that’s why it’s important to have some of those have that tracking pixel on the thank you page. And again I’m not smart enough to figure out how to actually do that, but that’s why — but you do need to have that, so you can figure out not only what — just because it’s cheap to get someone on the webinar doesn’t mean that they’re going to actually buy. Grant: And so that where you have to also play with the targeting a bit. Steve: Just curious, what’s an example of audience that’s been converting well for you? Steve: It’s because you are a ladies’ man, Grant. Sorry go on. Grant: I don’t know about that, I don’t know, maybe because I have a wife and three daughters, and so that resonates with the women. But in fact that’s an example of where it has typically we’ve found it costs us slightly more to get a middle aged woman on the — to register for the webinar, but they convert better. So even though it may cost me a little more upfront, I can also generate more revenue on the back end from there, so. Grant: Again, like, there is — I’m with you, there’s a ridiculous amount of little nuance to variables that you have to play with, so you know we’ve played with variables on what day of the week should the webinar be? Should it be an afternoon or an evening one, should you show a replay. How long should you leave the replay up? Should you do a promo? How many days should that promo run? So there’s just a lot of different variables, but one of the things that I really, really like about this webinar model is that every week you’re doing a new webinar. So every week you have a new opportunity to try something. Steve: Can you share some of your results, like I’m sure it’s going to be different for everybody, but when is the best time that you can run a — you run webinars? Grant: Well, typically we do either a Tuesday, Wednesday, Thursday. I try to do them in the middle of the week, and we do either three o’clock or seven o’clock central time. And so part of the thought on that, and part of the reason why we kind of go back and forth is we have a lot of people in Australia, a lot of people in Europe that are interested, but if you’re doing a seven o’clock, let’s say central time webinar, that’s in the middle of the night in Europe, but it’s first thing the next morning in Australia. But if you do let’s say three o’clock in the afternoon, you’re catching the Europe crowd, because it’s at night there, but it’s the middle of the night in Australia. So you have just – again like just because weird little nuances that you have to think through, and it’s not like we have massive amounts of business that come from Europe or Australia, but those are little things that you have to keep in mind as well as you just have to consider people’s schedules. Like just within the US, you’ve got four different time zones, and those are always going to fall at different times. You know, you’re catching people around lunch time, or dinner time, or their commute time home. Or they are putting their kids to bed, or — like you just got to think through some of those different types of nuances, and that’s where I think it’s good to test. And so we haven’t seen like a dramatic difference between the two. Steve: Does that mean it’s just a recording then at that point? Grant: Yeah, so it would be a recorded webinar, so it’s — you know there’s huge, huge value in doing it live, and there’s a lot of people that I’ve — you know I’ve kind of explained what we do to, and they said, oh you should totally do a recording. And I was like yeah, but A, I like doing the live one, and I think by doing a product about speaking, it helps to do a live one. Grant: And then I think there’s huge value in making that connection. You know as silly, and as simple as it may seem, you know answering someone’s questions live, or giving someone a shout out or saying their name on a live webinar is a huge deal to them, you know. Grant: And so by doing that live, it builds that connection, and it builds that rapport with people that you just don’t get from a recording. Steve: How many people typically attend and what’s your conversion rate look like typically? Grant: Yup, so we have typically right now about a 15 to 20% show up rate, which you’ve got to — which is a low show-up rate, but keep in mind this is a — it’s not bad for cold traffic. Because remember when they sign up from Facebook, they have no idea who I am. This isn’t people that are already on my list, they have no idea who I am, so usually around 15% will show up. So if you have 1000 people register, then we’ll have about 150 that will actually show up. Now from that group, we’ve had anywhere from like 6, 7%, up to — we’ve had a few that are like 15 to 17% that will actually then buy. Grant: And again there’s a lot of variables that go into that, because we’ve had the course out for three months, but we’ve also been — we’ve raised the price numerous, numerous times. And so the– how a $200 product converts is going to be different from how a $1200 product converts. And so that’s — and again the web bonuses you include or what — how — like if the promo is just up for that night, or it’s up for a couple of days, and what day of the week it ends on, so that’s where some of those different variables come into play. Steve: And in terms of just your return on Ad spend, what is that typically? Grant: Yeah, right now — I’m just scrolling over here on my spreadsheet. Right now on average for every dollar we spend in Facebook ads, we’re getting anywhere from like $3.50 to $5 back. Steve: What’s stopping you from just scaling this even higher? Grant: Yeah, that’s how we’re playing with is you know if this works at 4000 per campaign, would it work at 10,000 per campaign? But one of the big variables there is the — something about the — and again the guy that I’m working with could explain it better than I could, but just the — like if all of a sudden, you throw a ton of money, then it makes your cost per acquisition higher, and so the algorithm within Facebook kind of messes it up. So you almost have to start small, and kind of incrementally creep your way up, and Facebook adjusts accordingly, but if you throw a ton of money at it all of a sudden, you’re also going to — like let’s say we’re targeting Tony Robbins, okay? And there’s going to be a — and if he has you know, several hundred thousand, or a couple million likes and people that follow him on Facebook, there’s going to be a percentage of those people that are going to — that will be interested in seeing our ad, and then clicking on it and registering and actually showing up for a webinar. Steve: I would imagine you have to constantly find new audiences, because you’re going to exhaust the existing ones, right? Steve: They’re going to start see — okay. Grant: Yeah, exactly, and so if you, like if you continue to just market to just– again just going back to just Tony Robbins, and we are just marketing every single week. Because Facebook algorithm from what I understand is set up where it’s going to initially when you first target a group, it’s going to target the people within that group that are most likely to click and most likely to actually register. And so overtime, those people are– again you’ve kind of cherry picked those people. They’ve been on the webinar, they’ve registered, they bought, or they didn’t buy or whatever, but then you start getting in to more and more people who historically they don’t click on ads and they don’t register for webinars, but that’s who are you targeting at this point. So you are– the few that you do pick up means that you are spending more to get that person. So that’s where we are kind of at, trying to figuring out before we start spending even more, then we want to make sure that that’s dialed in so that we don’t double it, but then our conversion stays the same, but our cost is much higher. Steve: Okay. And so just to kind of summarize everything that I’ve learnt from you so far, so you typically do a five day campaign on Facebook. And people who even sign up the day before, if the webinar is tomorrow, that’s fine too, right? Steve: Okay. And then you are getting like a 10 to 15% show up rate. How many people do you typically like to be speaking in front of at a webinar? Grant: Well when you are doing a live one, some of it depends on the software you are using. We use LeadPage and its all– and then we use Google Hangouts and Chatroll and that all works out together. It’s a cost effective solution, you pay a couple of bucks for Chatroll and a little bit for Leadpages, but Google Hangouts is free, there’s no limit to the number of people that can be there. So there is kind of that social proof that goes along with a bigger webinar where there’s a ton of questions coming in, and you can tell that there’s people from literally all over the world. It kind of validates your decision to be there. So I’ve noticed that some webinars we do that have smaller numbers of attendants don’t convert as well as some of the other ones where people feel like they are a part of something that is bigger than themselves. Steve: Okay so what’s the size that you like to have at least? Grant: We like to have 100 people. It’s great but you know that’s always the number I kind of shoot for, but even if you have– I think even if you have 50 to 100 people, that’s still a good amount on a webinar. That’s enough conversation and chatter. And a lot of that you can read from– you can kind of get a sense from the how active the chat room is. But if you just have ten people there and you ask, “All right, anybody have any question?” You are going to be sitting in silence for a while. But just the kind of the law of numbers is that if you got 100 people on there, you are going to get a bunch of questions will start coming in. And again it kind of creates that energy and buzz there. I guess some of this maybe different depending on someone’s particular niche or industry, but for me I like to have 50, 75, 100 people on. So I think that– and again I don’t know if I have as much data to back up it back as much as just kind of gut feel. Steve: No that’s cool. Just curious, so some people you said 85% of people don’t come, do you guys hit them up again since you have their emails? Grant: Yeah we are trying to figure out that right now. And that’s something we’ve been playing with some different variables on– they opted in, they expressed interest, so what do we do at that point? Do we just– we are doing our webinar next week. Do we invite them to that one, and then the one after that one? And then do we just keep hammering them? And so right now what we are kind of landing on is we are going to create basically like a 30 day email sequence. I don’t know maybe a couple of emails a week. There’s just more consent and maybe like some soft cells around. And then maybe after 30 days maybe invite them back to another one. And so we are going to kind of play with that, because that is a huge factor of going like let’s say you have a thousand people register for a webinar. Let’s say you spent $3,000, and let’s say you had ten or fifteen people buy. That’s great but you still had 900 plus there who didn’t buy. So they expressed interest in that subject or topic, so you want to continue to reach out to them without stalking them and without bothering them or harassing them. And you want to continue to add value to what it is that they came for and what they are trying to learn. And I think you do a phenomenal, a phenomenal job at that of someone signs up for your email list– people need to get on your list just to like see your sequence. That’s what I did. It’s because like you’ve got, what is it like 30 different emails that go out? Steve: I got 30 right now, but I’m missing the webinar component which is why we are talking Grant. Grant: Yeah, very well. I’m missing the email part then, so we need to notes for sure, but you do a great job of that like continuing to stay top of mind with someone. And so some of it is they are interested in the subject and topic, but the timing is not right, or the money is not there. But if you stay top of mind and you continue to provide content, then when the timing is right, then they will come back and then buy. I assume for you, that you can probably speak to this better than I could, there’s probably some people that have been on your list for months and months and months, but they finally buy. I don’t know what the tipping point was, but finally they decided to make that decision to jump in. Steve: I mean sometimes it takes almost a year really. It’s weird. Grant: And again some of it depends on where the traffic comes from. Again like right now we have two tiers on the course. The top tier is $1,200 which is a huge, huge financial ask for someone who doesn’t know who I am. Now you have to build– so some of it is just like building that connection and building that rapport and building the credibility and building all that up and sometimes you can do that on a webinar. And we convert fairly well for $1,200 product on a webinar from cold traffic. Steve: Can we talk a little bit about the actual webinar itself. How do you structure that? Another thing that we do is that we give them a reason to stick around. And so right now what we’ve been playing with is, “Stick around to the end, I’m going to give you just a link to download the slides.” So some people will find huge value in that. So they are like, “I’ll just stick around just until I get that damn link.” And we don’t send them that out in an email. We just wait for– we just give that out at the end of the webinar. So I spend a lot of time in the beginning, building that credibility and the connection. I show a bunch of pictures. Like if it’s a speaker, I can show a bunch of pictures of “Here’s me on stage, here’s me in front of big audiences. Here’s some numbers. Here’s like the equivalent numbers, the number of times I’ve spoken, number of audiences,” that kind of stuff that just builds some of that credibility. Steve: So you basically give a background of what you’ve done in the past. Grant: Yeah you have to. You have to do that otherwise people will, “Why should I listen to you?” You have to give them some context of here’s why you should listen to me. And here’s why I’m knowledgeable on this subject or topic. So from there [inaudible] [0:41:15] meat of the webinar. So we’ll spend 30 to 35 minutes on that or so like really, giving very-very actionable practical stuff. Steve: Hold on in your case, what do you teach them, just as an example? Grant: Yes, I will teach them how to find decision-makers who are booking events. We talk about how to figure out what to talk about, and who you want to talk to. We talk about your website, your demo videos. Some of those like basic marketing tools that you want to have in place. We talk about contacting the decision maker, like what do you need to ask them, how do you build that rapport with them? How do you send them an email without turning them off? So like stuff like you could take all, so the transition piece then is, I would say, “At this point you have basically two options, you can take everything I’ve shown you and you can go get booked and paid to speak. It’s exactly what I did in my career to get booked and paid to speak. So you could take that, utilize it and it’s going to win for you.” Or– like there’s still much we haven’t even talked about. Like there’s still so much. So I’ll get a slide that shows, “Here’s like 10 or 12 bullet points. We haven’t talked about this. We haven’t talked about that. We haven’t talked about– like all these other pieces of speaking we haven’t even covered, we just scratched the surface. And it was so valuable, but there’s still a lot that we haven’t talked about. So like in your case Steve, you can talk about just choosing your product. And you could spend a whole webinar on that, but we haven’t talked about fulfillment. We haven’t talked about listing on Amazon or eBay or customer service issues, or payment processing. All these other things, like you just can’t just cover all of that. And so that’s where a webinar does good at saying, “I want to give you a bunch of information and some really helpful stuff,” but the reality is that there’s only so much that you can talk about in 45 minutes or an hour. So then at that point you’ll kind of transition into say, “Hey if you want more, we’ve put together a short cut. There’s a solution for you. And this is a course. I’ll kind of walk through the course and explain what else is in it. So we kind of layer that on top of each other, build that up, show kind of what the value of this would be. Here’s what the total price would be, here’s what our– here’s what some of the different options are of what you can get it for. And then one of the other things we do is we try to offer some type of fast action bonus. Meaning if people don’t buy then they generally won’t buy, because we– like right then they’re interested, they’re hot, they’re ready to make a buying decision, they’re ready to take a step. And so sometimes they just need that little extra push to go over the ledge and to make a leap and to jump and join. So we’ve tried this a couple of different ways. So we have done times words like, “Okay, we’re going to a fast action bonus, but you have to buy within the next 15 minutes. And then there’s other times where it’s like we’re going to give you until midnight tonight. And so in terms of the fast action bonus itself sometimes we’ve included, “I’m going to give you a bonus interview you know.” I did an interview with another speaker, and so they’re going some of their best tips and strategies, it’s not within the course, but we’re going give that for people who buy within the next X period of time. Steve: Do you avoid coupons? So you want to have a couple like different points there where they cause people to like to take action, so the closing of the cart, some of the fast action bonus, a discount going away. And I know people are like back and forth on discounts and all that jazz, so one of the things that we’ve been really consistent with is to let people know that whatever price we’re offering right now this is the lowest price you will ever see this. Meaning I don’t want to buy something and then, like if I go to Best Buy and I buy something and then a week later I see that it’s marked down 20% I’m going to be ticked. Steve: Do you send out the replay? Grant: We do, and again we’ve tried both. We’ve tried sometimes like over the top expressing in emails leading up to the webinar, and then on the registration page itself like ‘This is going to be live only, there will be no replay, you must show up live.’ Because if people know there’s going to be a replay, then like I don’t have any need to show up live, like why would I, you know. Grant: And so we’ve tried both, right now we do a replay, but when people ask beforehand we’re just kind of vague about it and just– because again if they know there’s going to be a replay there’s not a lot of incentive for them to show up live. So I want people there live. I think whenever we– I have to look it up here, I think whenever we– when we did it without a replay, I think we had like a maybe a slight increase in show ups. But then you got again that 85% or whatever the percent is that are definitely not going to buy, because they didn’t even get the chance to see the replay. So now we do the replay, but where we’re kind of leaning right now is just to leave the replay up or just to leave it shorter. If it’s something or it’s like, “Okay the replay is up and you got seven days to watch it.” Seven days is a longtime. So right now depending on the day of the week that we do it and when we want the cart to close, we try to do like three to five days at the most. Steve: Okay, Ed I know you run payment plans, do you kind of encourage them to pay in full with these promotions or no? Grant: Either or. Now with the– a couple of things that we’ve tried is saying, “Hey, we’re going to offer some type of bonus, but it’s only if you pay in full.” Like the discount is for people that pay in full, like for example I’ll give you the exact numbers. We– on the top tier it’s regularly, let me think here, 1397 and then on the webinar we discount at $200 to 1197. And then we have a payment plan of 197 for eight months. So if you want to– if you do the pay in full you can get that $200 discount, if you do the monthly plan there’s no discount, there’s no you know we’re going to take a month off, there’s no $200 deal. So we definitely try to push people towards the pay in full option. But the reality is also the higher the price point the more difficult– like most people don’t have $1200 lying around ready to pull the trigger on something. So the payment plan maybe more realistic for them in their financial situation. Steve: Okay, so let’s try to just sum everything up now. Let’s say I’m a new person who wants to start doing this webinar stuff and getting people on Facebook, what would you recommend as an initial budget in my goal for just my first webinar? Grant: Yeah, well, definitely like all this assuming that you got a product that you know exactly who it’s for, that you’re real clear on the solving a pain, solving a need there. So what I did again is I spend 100 bucks a day on that first webinar with the idea of if I can at that point if I’m selling it for I don’t remember like 300/400 bucks. Meaning like if I can sell basically two, I’m at least break even, and so that was kind of the goal was. Steve: So you use 500 bucks using your strategy right now for ads right? Grant: Yeah, $500 and again some of it also depends on the price point for your products. So let’s say that it cost you a couple of bucks to get someone on the list. Let’s say it actually– let’s say you got $100 product, but and even though it only cost you a couple of bucks to get someone on the webinar, let’s say the cost for an actual buyer is let’s say $90, that leaves you only 10 bucks of margin there. So at that point you got to kind of decide like, you know, I did this webinar, I spent all this money, and I had 10 buyers, but I netted $100, is that worth it? And again everybody is going to be different on that. Again I would say that you take 100 bucks a day, try those Facebook ads, try to get a feel for just how it works, how the webinar process works. A lot of people are very-very intimidated by it. As a public speaker it can be weird, but the same time you’re just you’re talking to people, and they signed up because they were interested in what you have to teach them. They’re interested in what you have to show them. Steve: Cool man, so I had another question. So have you ever had a webinar where just like 10 people showed up? Grant: We have done, kind of looking through my numbers here, we have had some that have been like slightly lower attended. The one that we had that like nobody bought was way low attended, I‘m kind of going through a percentage, our show up rates here. I’m looking at 11%, 13%, 20% and then it dips to 7%, and then after that it’s 14, 12, 15, 16, 11. Steve: What did you do differently, was it just the nature of the ad? Grant: I don’t know yeah. So in fact we’re like the Facebook ads guys talking to some other people on our team we were talking to and we were all just like just kind of scratching my head like, “I don’t know what happened.” So again like I think you can always in anything with statistics you can kind of throw out the bottom, throw out the top, and kind of get a better idea. So out of 16 if we have one that just we have an abnormally low amount of people show up for whatever reason who knows, you know. Steve: Yeah, yeah throw that out. Grant: Yeah, let’s go figure. Steve: Cool, Grant I actually leant a whole lot just talking to you today, and I want to be respectful for your time because I know you got another appointment after this, but thanks for coming on Grant. And if anyone out there has any questions about this or is interested in public speaking where can they find you. Grant: Yeah, you can catch me over at Grantbaldwin.com, and if you got any questions feel free to email me grant@grantbaldwin.com. And then if you’re interested in the speaking stuff, all of that is going to be at bookedandpaidtospeak.com. Steve: Awesome thanks a lot Grant, thanks a lot for coming on the show man. Grant: Steve really enjoyed it buddy, catch you next time. I hope you enjoyed that episode. After talking with Grant I got super excited about doing my own live workshops. In fact I’ve decided to do them on a regular basis now. So instead of offering a free one-on-one consult which is something that I did in the past, I‘m now going to offer free ecommerce classes on a regular basis. So if you’re interested in learning more about selling online, please sign up at Mywifequitherjob.com/workshop. For more information about this episode go to Mywifequitherjob.com/episode79, and if you enjoyed this episode please and iTunes and leave a review, because when you write me a review it not only makes me feel proud, but it helps keep this podcast up in the ranks, so other people can use this info and find the show more easily and get awesome business advice from my guests. It’s also the best to support the show, and please tell your friends, because the greatest compliment that you can give me is to provide a referral to someone else, either in person to share it on the web. If you’re interested in starting your own online business, be sure to sign up for my free six-day-mini course where I show you how my wife and I managed to make over 100k in profit in our first year of business. Go to mywifequitherjob.com and sign up right on the front page, thanks for listening. Outro: Thanks for listening to the My Wife Quit her Job Podcast where we are giving the courage people need to start their own online business. For more information visit Steve’s blog and www.mywifequitherjob.com. Omg… most frustrating podcast ever. All the guest did was beat around the bush and get so off topic. This could have been condensed to 3 minutes if he just got to the point.